What they are: Full weave extensions are a bunch of long pieces of weft applied to your hair on tracks. 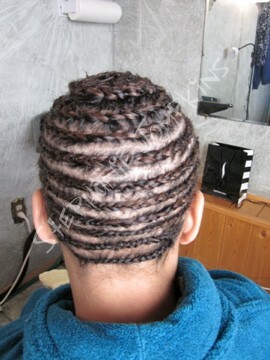 All your hair is braided in cornrows in a circular motion (or straight back) with the option of leaving the hairline out. A mesh is sewn on top for better closure. Or a seperate closure can be bought for a more natural look. The weft is then sewn onto the cornrows to make many tracks into a full weave. Who they are for: Full weaves are for anyone who wants to completely change their whole look or have really damaged hair and need to give it a break. With your hair being in all cornrows, full weaves are the best for letting your hair regain some health. Because your hair is still underneath the weave this method is not for anyone who has long hair. It will make the look too bulky. Shoulder length or shorter is best. Type of hair needed: Full weave is done with a long weft of hair, which is pretty much the most common hair that is sold. It is sold in one long strip, only one brand is sold in bunches (don't pick this up). Just make sure the top is stitched across. You can get it machine weft or hand tied. Hand tied sheds less than machine weft and therefore lasts longer but of course is more pricey. For a full weave you need lots of hair. Because all your hair is covered you can do either synthetic (which is best for curls) or human hair. For synthetic you will need average 4 packs. For human hair you will need about 2.5-3 packs. You can purchase a closure seperate for a more natureal look if you wish. Kind of hair: If you are looking for curls that will last you will want to go with synthetic hair. Synthetic hair can not be applied to heat but it holds the curl the best. If you want something more natural that you can play with you want to go with human hair. The best hair is called Remy hair. Remy is not a brand itself, it is just a type of hair. Remy means the cuticles are pointed in the same direction. This is the healthiest hair, it lasts longer, and reduces tangles. So you can choose any type of brand you want but you want to make sure it is "100% human remy hair". Remy hair is not cheap hair. Color: The best thing about a full weave is that you can choose any color you want! That is if you are getting all your hair covered. If you plan to leave your hairline out for a more natural look you will want to match to the color you currently have. I can color match but my color line is different from extensions color line so there is no guarantee of a match. Installation: Installation time takes about 2 to 3 hours. Installation includes 3-4 bags of hair. Installation also includes any cutting/blending needed for a natural look. Every installation gets a take home care sheet as well if needed. Cost: $195 for installation. These can not be tightened. $70 for removal. Cost of hair varies. The cost depends on the length you want and the quality you want. Low end can be as low as $80 for 12 inches and high end can be as high as $300 for 20 inches. You usually dont reuse your hair with a full weave because the weave lasts so long, so I suggest not spending a great amount on hair. Synthetic hair is very cheap. Because it is not real hair, it can not be reused and can not be applied to heat, synthetic hair can be as low as $10-$20 per pack. Risks: These extensions do not damage your hair. In fact they help with the growth of your hair! They can be itchy though. Consistent scratching can create bumps/pimples and/or sores/scabs. Length they last: On average these extensions last 2+ months. Tightening can not be done as the cornrows are what loosen up and its too hard to get in underneath to tighten them like tracks. How long they last also depends on how fast your hair grows and how well you take care of them. But these can last a very long time with no in-between maintenance. Maintenance: Use your leave in conditioner and serum everyday! Serum will help reduce tangles dont be shy. Leave in conditioner helps with brushing so you are not snapping hairs that will eventually matt up. Use an oil directly on the scalp to help grow your hair and also help with itchiness. You must brush the hair at your scalp, sections are always a good thing. If you have synthetic hair you will want to get a synthetic detangling/shine spray as well. Removal: Upon removal the thread is cut and the braids are brushed out. Do not get your friend to do this after they have been in a long time! Sometimes the thread hides in the regrowth and can accidently be cut. Come see me. I am patient. Remember that everyday we shed naturally 50-100 hairs. When you have a full weave the hair has no where to go it is caught in the cornrows. When your extensions are taken out you will lose hair. This is only your natural shed that has already fallen off. There will be a lot as full weave extensions are the worse for build up of shedding especially over long lengths of time. But it is completely normal. Removal includes a good shampoo! Why you should get them: Because they are the best method to give your hair a break and regain some health. They are easy on the pockets. They can add highlights or lowlights instantly. They add beautiful lengths and volume. They can instantly change your appearance to anything you want!